I’ve done something I haven’t done in a while. At a beautiful cabin in the remote British Columbia Chilcotins, I’ve picked up a Maclean’s news magazine. January 28, 2013 edition. Brian Mulroney is out of political purgatory, and only too happy to tell Canadians (and Stephen Harper) what real leadership is. “He’s better than Harper,” my uncle replies. I read a little of the article, which idly fawns over the man’s persona for a couple paragraphs. It uses the words “edict” and “fatwa” to describe Harper’s (the present Prime Minister) public disavowal of Mulroney, who on the one hand won consecutive majority governments, and on the other resigned from his party’s leadership under pressure from his own caucus and left politics as one of the most unpopular PMs in Canada’s history. He left his government and his party in a shambles, with the hapless Kim Campbell in charge to take responsibility for the Progressive Conservative party’s decimation in the next election. They lost all but two seats. Amongst the losses, Campbell’s own riding. So how can it be, his resurrection? Well, the conservative McLean’s has its own interests. And Harper recently ended the fatwa no doubt for political ends. But… why? To what end? Should I dig in? I skim. Two quotes catch my eye. 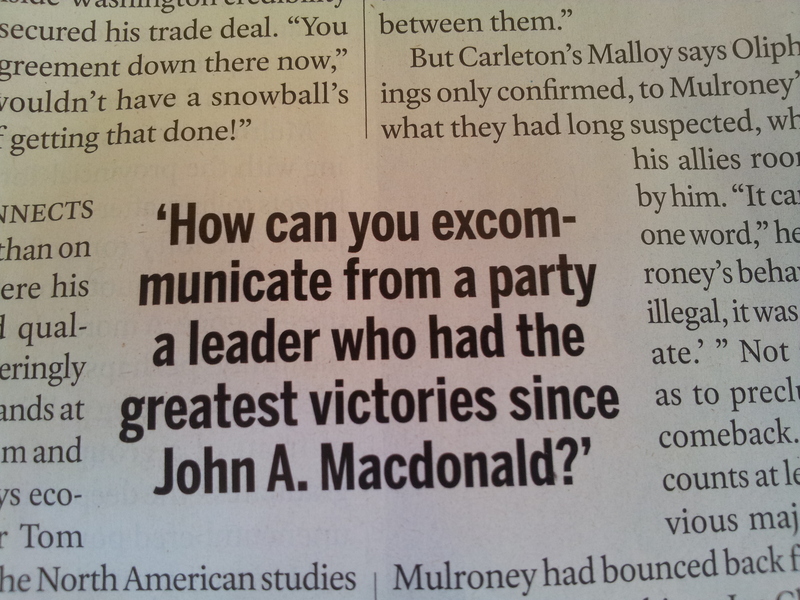 How can you excommunicate from a party a leader who had the greatest victories since John A. Macdonald? He’s referring, of course, to those two majority wins, neglecting to account for the greatest defeat in the history of Canadian politics. I wonder if, had he refused to step down, his party would even have kept those two lonely seats. He may also be referring to NAFTA — the North American Free Trade Agreement — which has more tightly bound the economies of Canada and Mexico to their super trading partner, the USA, while dismantling ever further the avenues by which the citizens of those countries can participate in choosing how those economies function. Under NAFTAs jurisdiction, the acceleration of rich getting richer and poor getting poorer has been remarkable. Mr. Mulroney, I didn’t know John A. Macdonald. I wasn’t even in this wonderful country when he famously lead it. But I can assure you, you’re no Jack Macdonald. If that quote marks the quality of his arrogance, the next is a stunning admission of insecurity. I’d love to be PM again, I miss the adulation. OK. I’m done. I close the magazine. Leave it there, on the dining room table, in the sunshine streaming through the enormous bank of windows which make up the south wall of this beautiful cabin. 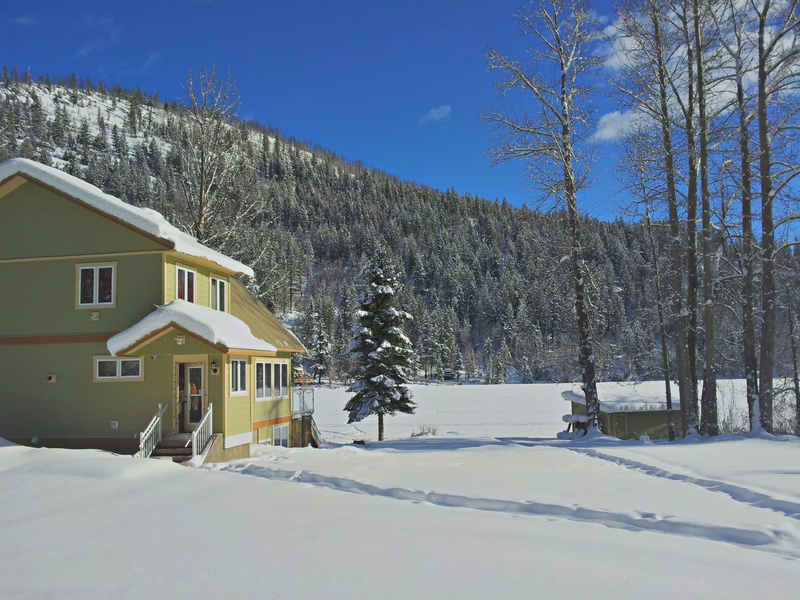 Outside, the snow drapes the conifers and hangs over the eaves of cabins across the pure white blanket that is Tyaughton Lake. 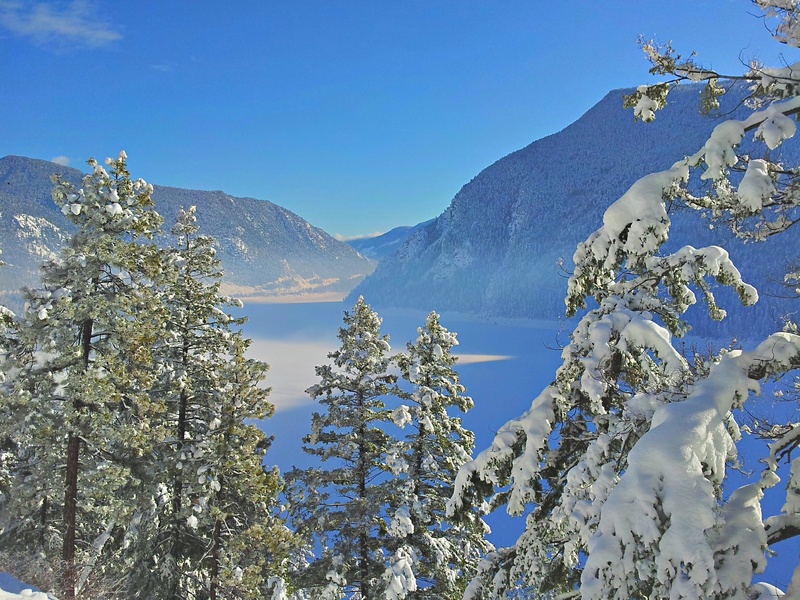 The sky, a crystalline blue across which puffs of white scurry on their way east, cradles the sun which we saw very little of the last few days while this new coat of snow fell to Earth. For a moment, the comparison rattles around in my head. “Better than Harper,” my uncle had said. What will Harper be saying some 30 years after he leaves office in complete disgrace? I’d love to be PM again, I miss the power. No. Clearly six of one, a half dozen of the other. Two sides of the same coin. If I were elected President, I would have to impeach myself for all the crimes I was about to commit. In the American political system, there is no way to vote against the interest of Goldman Sachs. It’s impossible. Or Exxon Mobil. When we pulled away from the cabin a few hours later, the Macleans magazine rested still on the dining room table. Perhaps this time I will manage to go longer than a year without needing to be reminded why I do not need to read its contents.